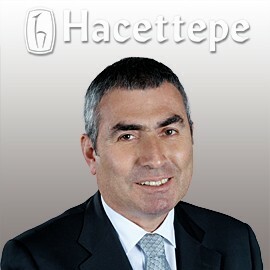 Hacettepe University Hospitals - Prof. Uğur ERDENER, M.D. Prof. Uğur Erdener, M.D. was on duty of Directorate General of Hospitals between 2000 and 2007 and of Rector of Hacettepe University between 2008 and 2011. Uğur Erdener, who was born in June, 15, 1950, has his primary school education in Van and secondary school education in Bandırma, because of the duty of his father. After he completed his high school education in Ankara Gazi High School, he attended Faculty of Medicine of Hacettepe University, where he thought he could achieve his desire to be a physician in the best way. After he graduated from the university in 1977, he studied for postgraduate degree in Ophthalmology Department of Faculty of Medicine of Hacettepe University. Being a physician and an instructor, Uğur Erdener maintained all his Professional life in Hacettepe University. He became an associated professor in 1996 and professor in Ophthalmology Department. Erdener, who also carried out the duty of Head of Ophthalmology Department, has still been holding office as an instructor in Ophthalmology Department of Faculty of Medicine of Hacettepe University. Uğur Erdener who carried out theoretical and practical activities especially on oculoplastics, mobile ocular prostheses and orbital implants, has attended various ophthalmology trainings and congresses on these issues as a panelist, gave lectures and performed educational surgical practices in university clinics. Sports takes an important place in the life of Uğur Erdener. In his sports career, which he began as an amateur sportsman, he got to all phases, and he reached the upmost stages to which a Turkish sportsman has ever reached in the international platform until now.